Use the same procedure for the LH side and RH side. The following procedure listed below is for the LH side. 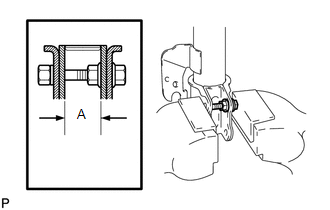 (a) Install the bolt and nut to the front shock absorber assembly as shown in the illustration and secure the front shock absorber assembly in a vise using aluminum plates. 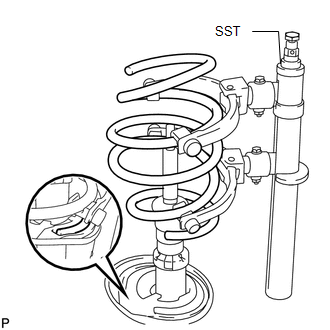 (a) Install the front coil spring lower insulator to the front shock absorber. 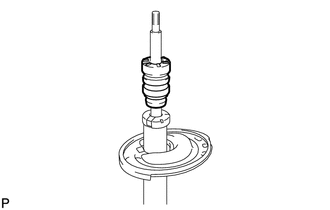 Make sure that the positioning pins on the front coil spring lower insulator are inserted into the holes in the front shock absorber. 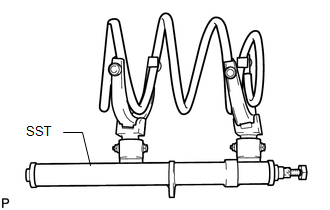 (a) Install the front spring bumper to the front shock absorber. 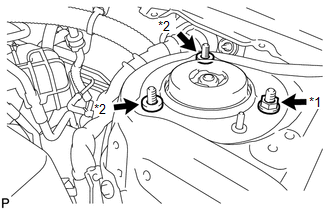 (a) Install SST to the front coil spring with the hooks spread as far apart as possible from each other. Make sure that the claws on the hooks are securely engaged to the spring. 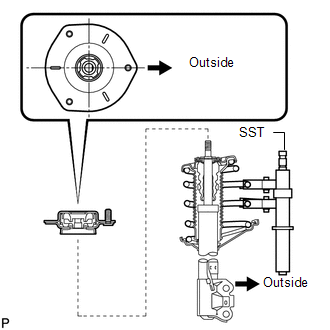 (b) Using SST, compress the front coil spring. 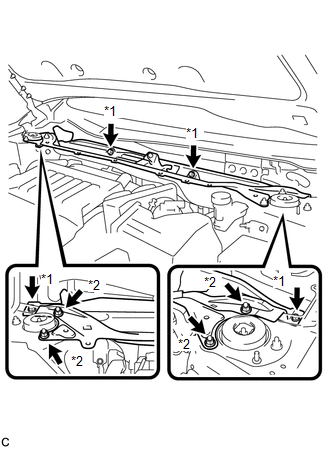 (c) Install the front coil spring to the front shock absorber. 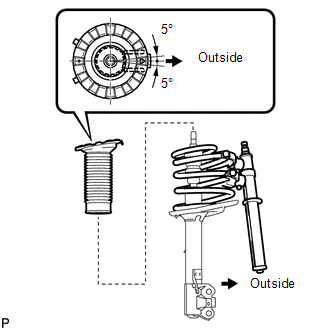 Make sure that the end of the front coil spring is positioned in the depression of the lower spring seat. 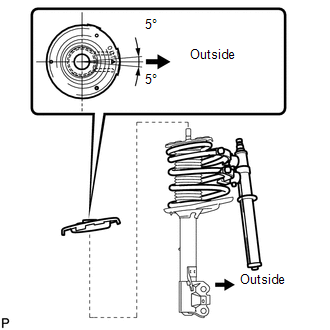 (a) Install the front coil spring upper insulator as shown in the illustration. Any misalignment between the front shock absorber lower bracket and the alignment mark must be +/- 5°. 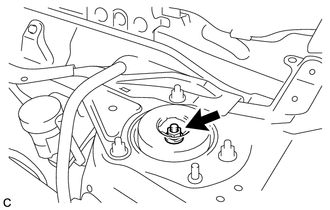 (a) Install the front coil spring upper seat with the mark facing to the outside of the vehicle. 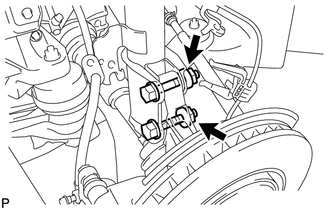 (a) Install the front suspension support bearing as shown in the illustration. 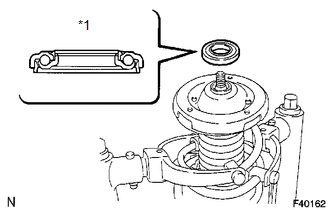 If there is foreign matter inside the front suspension support bearing, replace it with a new one. 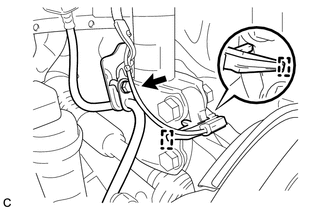 (a) Install the front suspension support sub-assembly as shown in the illustration. Check that the slots on the piston rod and front suspension support sub-assembly are aligned. (b) Temporarily tighten a new front suspension support nut. 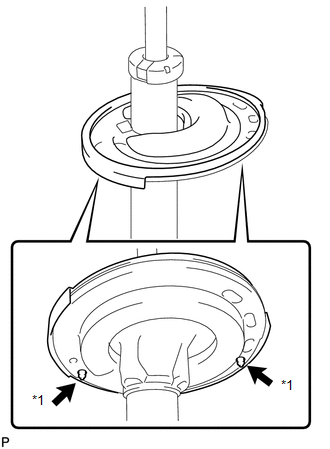 (a) Install the front shock absorber with coil spring (upper side) with the nut and 2 spacers. (b) Install the front shock absorber with coil spring (lower side) to the steering knuckle and insert the 2 bolts and 2 nuts. 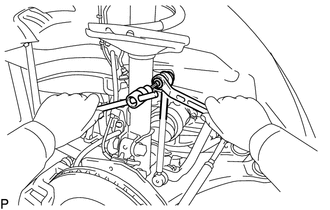 (a) Install the front stabilizer link assembly to the front shock absorber with the nut. (a) Install the outer cowl top panel with the 4 bolts and 4 nuts. (b) Engage the 2 wire harness clamps to the outer cowl top panel. 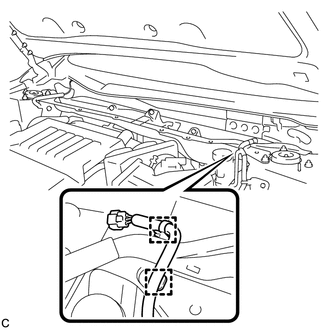 (c) Engage the 2 wire harness clamps to the outer cowl top panel and connect the connector (w/ Windshield Deicer). (a) Fully tighten the front suspension support nut. 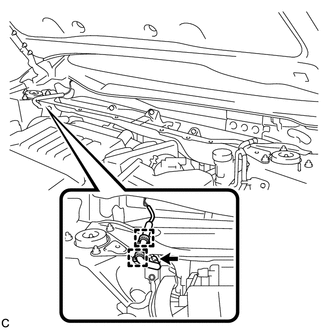 Inspect and adjust the front wheel alignment (See page ).